Bodyweight Flow is a weight-loss program which utilizes bodyweight exercises created by Tyler Bramlett. Bramlett has formed communities of fitness enthusiasts in the past, and used his own weight loss struggle to formulate Bodyweight Flow. He is considered a Functional Training Expert, and he is a Certified Russian Kettlebell Instructor, Certified Kettlebell Functional Movement Specialist, and a United States of America Weightlifting Sports Performance Coach, a certification gained through the Olympic committee. He is also Crossfit Level 1 Trainer Certified. Bodyweight Flow is an exercise program that claims to boost weight loss by helping users burn more calories with every workout. It also claims to help the user further flexibility, reduce aches and pains, reduces workout-related injury, and reduces the time it takes to get a full workout. The Bodyweight Flow program costs $19, and interested consumers can try the program for just $1 for ten days. After those ten days, the remaining $18 will be charged to the user, unless they cancel first. The program includes various materials and tools that help the user through each step of the process. First, the consumer can review The Bodyweight Flow Quick Start Guide. This eBook is an introduction into the process and provides motivation. Next, each body portion is broken down into segments. There are 21 Follow Along Upper-Body Routines, 21 Follow Along Lower Body Routines, and 21 Follow Along Full Body Routines. 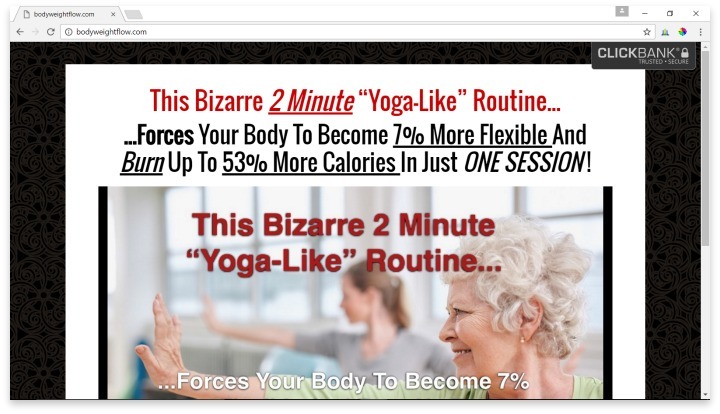 Each segment is broken into seven beginner, seven intermediate, and seven advanced videos that allow users of all levels to further their fitness or maintain their levels. Bodyweight Flow users also get a Daily Flow calendar which helps them plan and keep track of their progress. This, combined with the Exercise Pairing Guide, which helps the user figure out which exercises should be performed on the same day, helps the user customize their routine. One of the main perks of this program is that users can get a full-body workout without expensive equipment or a gym membership. The leading drawback for users who are looking to lose weight is that there is not a nutritional guide included in this program. Bad eating habits are the main culprit for most who suffer from being overweight or obese. While exercise does play an influential role in getting in shape, it’s important for people to understand the effects of their food choices. Unfortunately, they’ll have to look outside of this program for help. There are few consumer reviews that aren’t sponsored by the company that created Bodyweight Flow. While they could be truthful, they are unreliable because of their connections with the Bodyweight Flow team. However, the program also comes with a 60-day money-back guarantee, so consumers who don’t enjoy the program can easily get their money back. Bodyweight Flow is a weight-loss program which utilizes bodyweight exercises by helping users burn more calories with every workout. Bodyweight Flow is a low-cost program that is good for what it is. It should be considered more of an exercise program than a weight-loss program. The range of workout videos included with the purchase is excellent. The fact that users don’t need fancy equipment to get a full workout is a plus. Combined with a healthy eating plan, this is an affordable option that can help people burn calories and get moving in their own home. Have you had an experience with this company? Please share your Bodyweight Flow reviews below.